On May 18, the U.S. Consulate and the U.S. Coast Guard recognized four shipping companies registered in Bermuda for participating in the United States Coast Guard’s [USCGC] voluntary search and rescue network, AMVER [Automated Mutual-Assistance Vessel Rescue]. Search and rescue authorities around the world use the voluntary ship reporting system to assist ships and aircraft in distress at sea. For 59 years, the AMVER program has provided emergency assistance to those in need on the high seas. With 8,089 vessels on plot for any given day, AMVER ships were responsible in 2016 for saving 283 lives, searching 134 vessels and providing medical, communication needs or food and fuel supplies for 52 people. This rescue system has saved one life every 24 hours within the past 10 years. Edith Robinson [representing Teekay Shipping Services Ltd.], U.S. Consul General Mary Ellen Koenig, Barry Brewer [accepting the award on behalf of Fairfield-Maxwell Services Ltd.], Commanding Officer of the U.S. Coast Guard Barque Eagle, Capt. Matthew Meilstrup. SeaTeam Management Pte Ltd. for the Golden Eminence, Golden Empress, Golden Endeavor, Golden Zhejiang, Golden Zhoushan, Sea Bay, and Sea Hope. As an example of the life-saving measures performed by AMVER vessels, the container ship Oleander rescued four men from sailboat Elle after they encountered a tropical storm during the North American Rally to the Caribbean [NARC] rally in 2011. On its way to Bermuda, the Oleander answered the distress call and brought all four crew members on board as the storm had caused extreme damage to their ship. In the AMVER system, participating ships send a sail plan to the AMVER computer center, indicating their ports of departure and arrival, course and speed. Vessels then report every 48 hours until arriving at their port of call. Thus AMVER is able to project the position of each ship at any point during its voyage in relation to a mariner, vessel, or aircraft in distress. AMVER rescue coordinators can then divert the best-suited ship or ships to respond. Amver improves the chances for aid in an emergency and can reduce the time lost for vessels responding to calls for assistance by coordinating a rescue response, utilizing ships in the best position or with the best capability, thus eliminating unnecessary diversions by other vessels. By regular reporting, someone knows where a ship is at all times on its voyage in the event of an emergency. Regular AMVER reports compress the area of a search if a ship is unreported or overdue, because AMVER position reports verify that a ship arrived at a certain point on its voyage at a particular date and time. 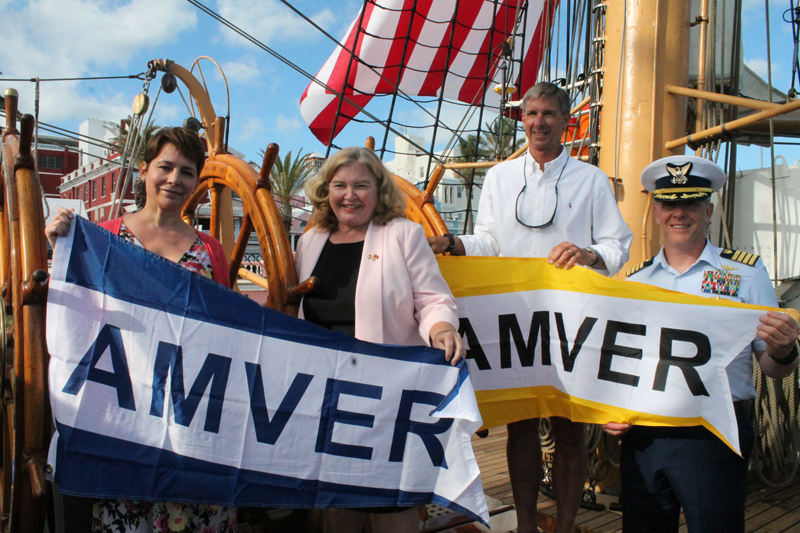 Participation in AMVER is voluntary, free of cost, and open to all ships of all flags. AMVER information is protected as “commercial proprietary” information and is released only to recognized national search and rescue authorities, and only in an emergency.